Isn't She Lovely: Stocking Stuffers Anyone? This will most likely be the most last minute stocking stuffer blog post you will read this holiday season. I had good intentions of getting it out there last week, but sickness has taken hold of my happy little family. Evie and I fought off the desire to sneeze every second of every day last week, and Lila has now been barfing for the past day and a half. Merry Christmas to us! I almost decided writing this post was silly and wouldn't help anyone. But, seeing as how my husband and many other men are out there as I'm typing this day before Christmas Eve I think it's only fair to throw a bone to the last minute shoppers. Stocking stuffers are one of my absolute favorite parts of Christmas. You can get silly, creative, sweet, and over the top all at the same time if you want. And, it all fits in one cozy spot like a treasure chest waiting to be spilled over onto the floor. 1) Instead of candy I am throwing in locally made honey sticks! I was so proud of this idea even though it's such a simple thing. In addition there will be beeswax lip balm made by the same company. 2) Lila loves stuff like this and I have tons of random fabric, so this Fabric Scrap Paper Doll Kit will be an easy little goodie to create. Evie is a Playdoh fanatic these days so her homemade stocking stuffer will be this, this, or this. 3) I just realized a few days ago that Target is now selling Piggy Paint (or maybe they've been selling it for a while). Piggy Paint is non-toxic nail polish for kids. I bought each of my girls a bottle of purple. 4) My girls tend to fight over the most random things. For some reason, one such item is the toothbrush. One had purple and then that one disappeared so she wants the other one's purple toothbrush. First, where do the toothbrushes go? Second, sharing a toothbrush is the most terrible idea ever. I also found these decorate your own Spinbrushes at Target and bought them immediately. Problem solved (hopefully). SIDE NOTE - I would say for my dear husband, but then he would know what his stocking is filled with and that's no fun. This way he can try to guess if I actually got him one of these or if it's something I would love to see in MY stocking! 1) The lovely folks over at Powerocks sent me a Magicstick rechargeable battery to try out and it's clearly perfect for any stocking you have to stuff! I've been using mine for a few weeks, and I really love how many digital devices I can recharge with the Magicstick. While it's the perfect size for a stocking stuffer, it also makes a great present all by itself. 2) I'm all about buying local. Turnrow is a great bath and body company that is local to Atlanta. I'm a big fan of their soaps. 3) Another local favorite of mine is Beautiful Briny Sea. For the grill master in your life or the salt and spice loving cook these small batch culinary sea salts are amazing and are the perfect stocking stuffer size. 4) Lastly, I always try to think of everyday favorites for the stocking. Things like socks, candy, gum, and iTunes gift cards are always a hit. They are pretty standard, but if you throw in a few non-standard items like the ones listed above then it all balances out. 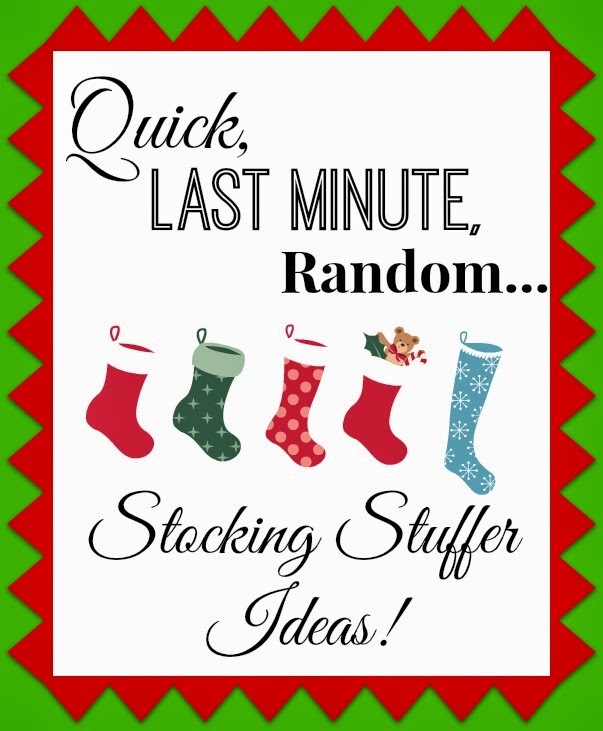 Alright, off you go to grab those last minute gifts or items to make a quick, cute, homemade stocking stuffer for your kids. Good luck!